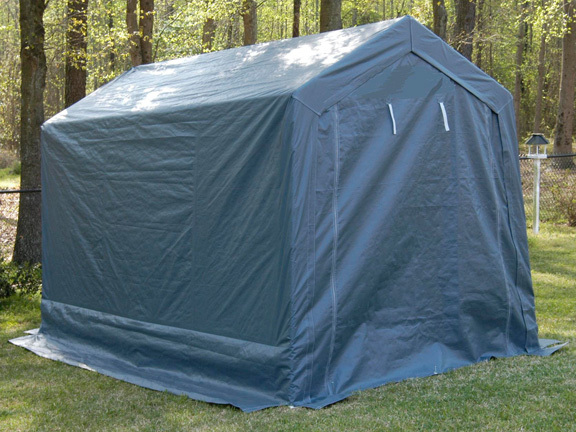 This Enclosed A - Frame Garage Canopy by King Canopy is the perfect structure to store your lawn and garden items or equipment and measures approximately 7 ft x 12 ft. This classic A-frame designed canopy is constructed with 20 gauge 1 1/2 powder coated steel frame and features a solid real wall and double zippered roll up door at the front end. 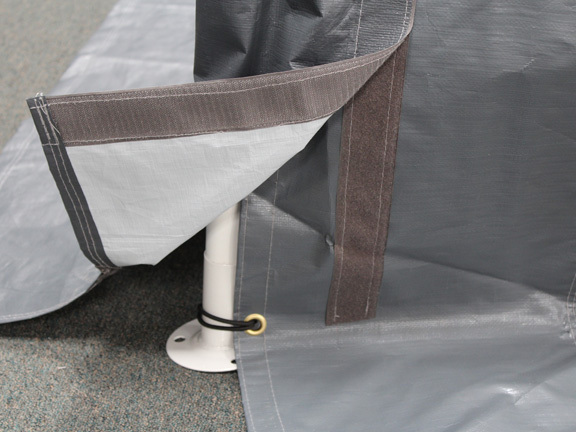 This structure is covered with a heavy duty 9 oz silver polyethylene material and comes with secure hook and loop fasteners. 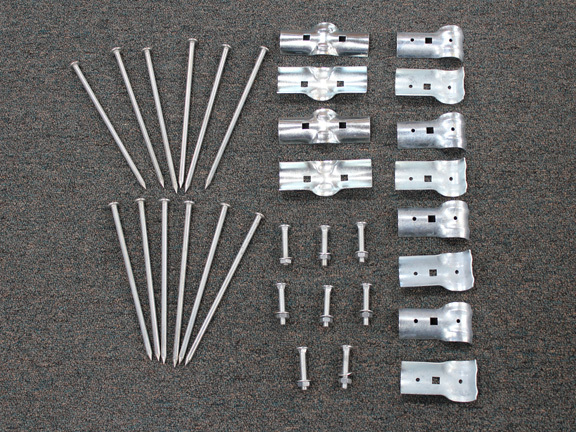 This set includes anchors and ball bungee cords and the flaps can be buried to seal the bottom of the structure. Can I buy another cover, if we have a hail storm? 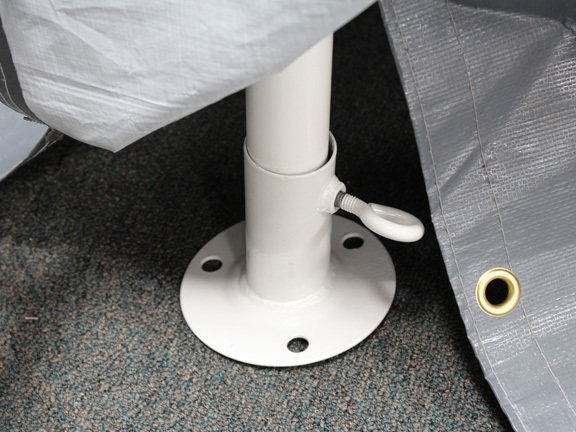 The replacement cover would have to be purchased from King Canopy, but is available. Thank you for your inquiry! Is the King Canopy #G0712, E-Canopy #PPC-G0712, available in a dark green color? This item is only available in gray. Could this be used for winter storage in the northeast with snow? This item is a permanent structure, but it is not snow rated. 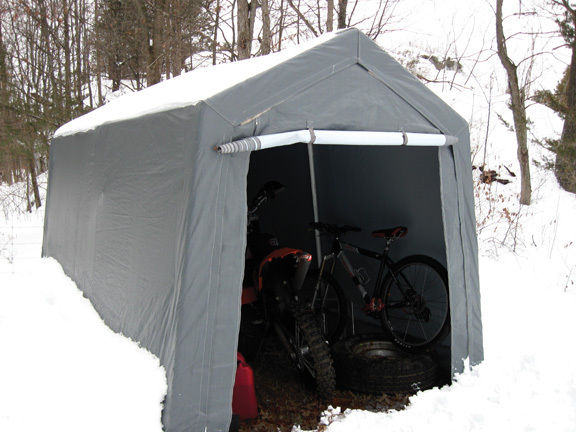 Please view our snow rated shelters here. What is the door opening height and width? Those dimensions for the door are: 6'7" Wide Bottom / 5'3" Wide Top / 5'6" High. How wide is the door opening? I have a Harley Davidson Trike that is 59" wide and 9 feet long to fit inside. This door opening is 5'4" at the bottom and 4'4" at the top. 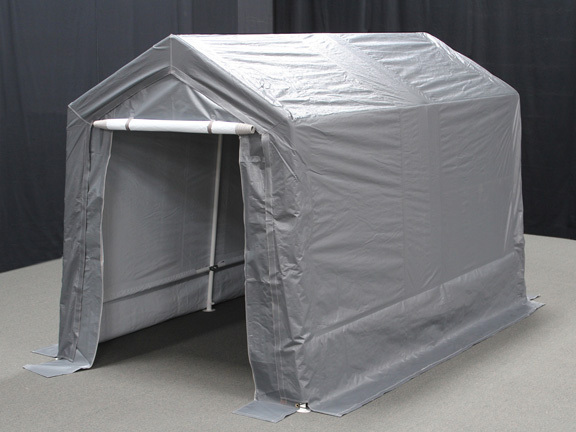 The 7' x 12' King Canopy Part Number: G0712 is reported on some websites to include a 6oz cover while this ad says the same model is a 9 oz material. Which weight is accurate? Also, some websites offer various color options for this model. Do you have the 7' x 12' model with 9 oz. cover material available in a green or brown color? Thank you for your inquiry. 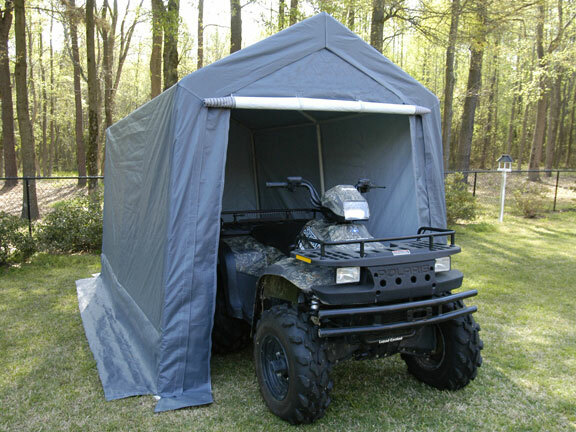 The King Canopy Enclosed 7 Foot x 12 Foot A-Frame Garage Canopy we carry is only available in grey and the material is a Heavy-duty 9 oz. (245 g/sq. m.) silver polyethylene cover. Do these tents have trouble with moisture collecting inside from the ground? We have had no reported problems of this. However, the manufacturer does not state that it cannot happen. The door tapers so the top width is 4'4" and the bottom is 5'4", and the height is 5'9". 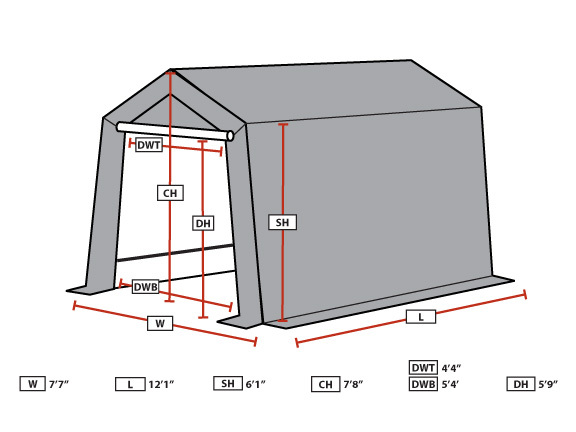 How difficult would it be to lower to overall height of 7X12 A-Frame to about 6 feet? Can I download a construction manual? We do not recommend altering the shelter as this will void the warranty. You may download a manual by clicking here. Does your company provide assembly for the Southern California area? Unfortunately, we do not offer assembly services. You may wish to check your Yellow Pages for licensed handymen or contractors. It has a one year warranty against manufacturing defects. This does not cover wind or other weather damage or damage caused by improper anchoring. If purchased, please be sure to read your entire manual for correct usage. I knew this product must be available, but I could not find a similar item at any store I visited. I feel fortunate I found this canopy online. It was delivered to my home in less than a week and I was able to provide a workable solution for covering my newly acquired mowing equipment. ProsAll components are quality and complete. Easy to assemble. I would like to have a building like this. I only have room for a 6 foot wide by 8 feet long. Loved this one though. It was so easy to assemble. Everything was in the box and fit great. I did it by myself in a short period of time and now my golf cart has a dry place and even have some storage room in the front. Rains a fair amount in the great northwest lol. ProsFast delivery, easy installation, looks great, strong materials. I purchased this and the Shelter Logic 8 X 8. 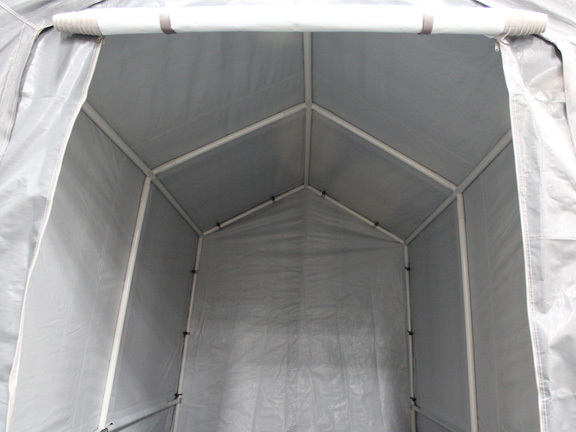 Although the Shelter Logic appears more prepared for wind/weather, the King Canopy can be easily setup by one person. I found a small tear in the tarp and the box was missing a piece that was quickly mailed when I brought it to their attention. Overall I prefer the Shelter Logic, but the setup was much easier for the King Canopy. ProsEasy setup for 1 person.